The ProUltra ENDO ultrasonic instruments may be used in both conventional and nonsurgical endodontic treatment to perform a variety of clinical tasks. 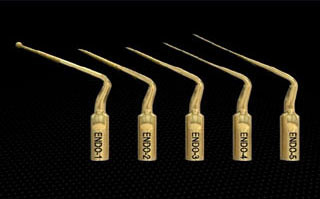 The ProUltra ENDO 1-5 tips are stainless steel instruments abrasively coated with zirconium nitride. Zirconium nitride resists corrosion, regardless of the irrigant employed, does not flake off during use, and provides safe efficiency when performing delicate and precise intracanal procedures. The ProUltra ENDO 6, 7 and 8 tips are a special titanium alloy and their unique geometries allow precision work in areas of limited access. 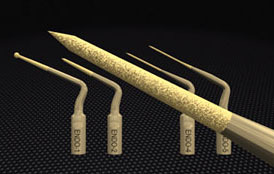 Clinical applications of the ProUltra ENDO tips include eliminating pulp stones, refining access cavities, troughing for extra canals, chasing calcified canals, and activating intracanal irrigants. In the field of nonsurgical retreatment, ultrasonic applications include: Eliminating core materials from the pulp chamber, exposing previously missed canals, removing obturation materials, retrieving posts and broken instruments, and vibrating and adapting MTA (ProRoot) into pathologic or iatrogenic defects. Note: Advantages of ultrasonic instruments without water ports include enhanced vision, improved safety, better efficiency and decreased breakage. An external water source is recommended when working at higher power for sustained periods of time, like when removing a large, metallic post. 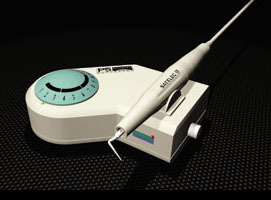 The Satelec P5 (Dentsply Tulsa Dental) is the piezoelectric ultrasonic unit of choice for performing endodontic treatment, retreatment and other dental procedures. This unit affords precise working accuracy and has a broad and incremental power range. The P5 has a unique "feedback" system which measures tip resistance, regulates tip movement and reduces the potential for tip breakage. The ProUltra ENDO tips should be used starting at the lowest recommended power setting and increased, as needed, to accomplish the clinical task.